NORTHEAST — A former member of the Edmonton Jewish community, Cpl. Mike Benjamin, was one of the first responders that came to Humboldt Saskatchewan this month to receive a commendation from the Governor General for his response to the Broncos bus crash. Governor General Julie Payette presented the commendation at a reception at the Humboldt and District Gallery on Oct. 20, 2018. 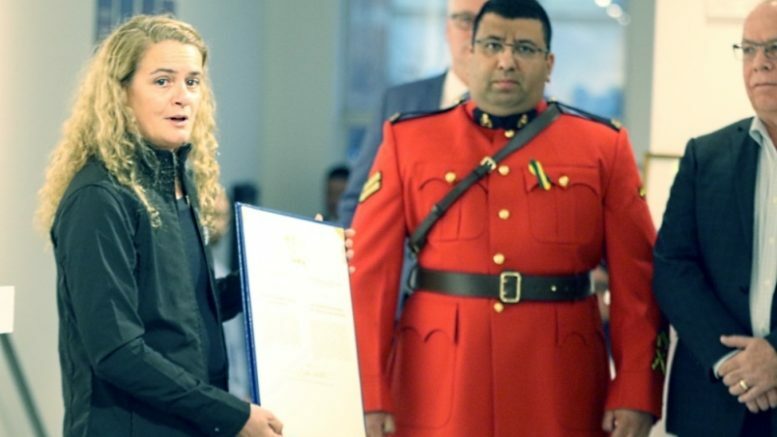 “It’s with the thanks and gratefulness of all Canadians that I’m in the position to offer you this outstanding commendation for all of the first responders that helped in the tragedy,” Payette said. Seven came to accept the commendation: Cpl. Mike Benjamin of the Tisdale RCMP, Evan Sisson of the Tisdale Fire Department, Cst. Lisa Reimer of the Nipawin RCMP, Bruce Pihowich of the Nipawin Fire Department, Maurice Lalonde of the Zenon Park Fire Department, Jessica Brost of Northeast EMS and Ryan Reimer with the conservation service. Rob Muench, Humboldt’s mayor, said he was happy to see them there. Also given a commendation were the citizens of Humboldt for demonstrating solidarity, strength and resilience by offering steady support to the families of the victims. “This is one of the great privileges of this position, is to be able to recognize the extreme engagement and dedication of the community,” Payette said at the presentation ceremony at the Humboldt and District Gallery. Muench accepted the commendation on behalf of the citizens. The Governor General expressed hope that something positive would emerge from the tragedy. On behalf of the Edmonton Jewish Community, Yasher Koach to all the first responders and particularly to Cpl. Benjamin, an Edmonton Talmud Torah and Menorah Academy alumni. This article was originally published in The Tisdale Recorder, with text added from Edmonton Jewish News. Be the first to comment on "Corporal Michael Benjamin receives Governor General’s commendation"